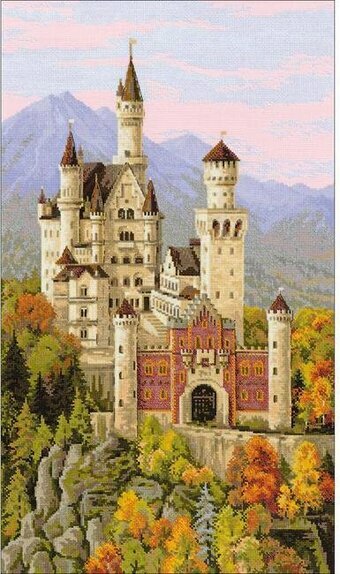 This cross stitch kit contains one color chart, 14 count white Zweigart Aida Fabric, woolen and acrylic yarn Safil 24 colors, one needle and instructions. 15 3/4" x 9 3/4". Christian themed cross stitch kit featuring a Guardian Angel. This cross stitch kit contains 14 count white Aida Zweigart fabric, Safil wool/acrylic and Anchor stranded cotton threads (22 colors), beads, Anchor metallic thread, 2 needles, instructions and color chart. 8.25" x 11.75". Cross stitch kit featuring a dog. This package contains 10 count fabric for cross stitch, woolen and acrylic yarn (fourteen colors), one needle, instructions and a color chart. 9.5" x 12", 10 Count. This cross stitch kit includes one color chart, 14 count Zweigart Aida fabric, woolen and acrylic yarn 25 colors, one needle and instructions. 11.75" x 15.75". This cross stitch kit includes 10 count flaxen Aida Zweigart fabric, Safil wool/acrylic threads (17 colors), needle, instructions and color chart. Size of finished piece is 60cmX60cm, 23.5"X23.5". This cross stitch kit includes 14 count white Aida Zweigart fabric, Safil wool/acrylic threads (39 colors), needle, instructions and color chart. 15.75" x 11.75". 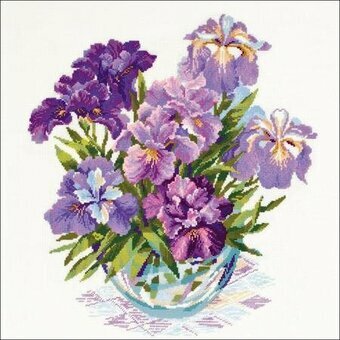 Cross stitch kit featuring a Lilac Orchid flower. This cross stitch kit includes 14 count Aida Zweigart fabric, Anchor stranded cotton threads (13 colors), needle, instructions and color chart. 8.25" x 11.75". 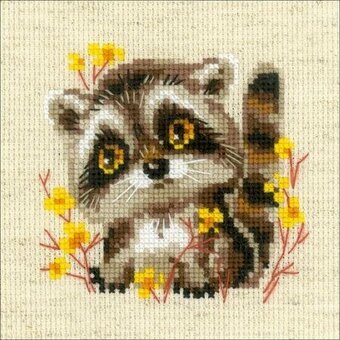 Cross stitch kit featuring a Teddy Bear. This cross stitch kit contains 10 count white Aida Zweigart fabric, Safil wool/acrylic threads (7 colors), felt, needle, instructions and color chart. 5" x 6.25". 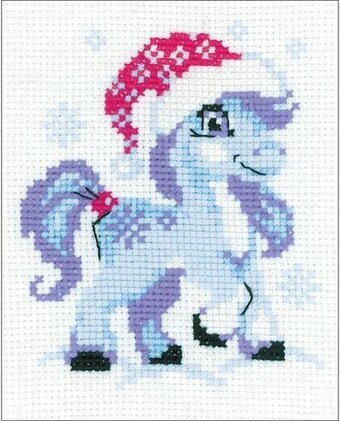 This cross stitch kit contains 10 count Zweugart Aida fabric, woolen and acrylic yarn (8 colors), felt and one needle. 6" x 6". 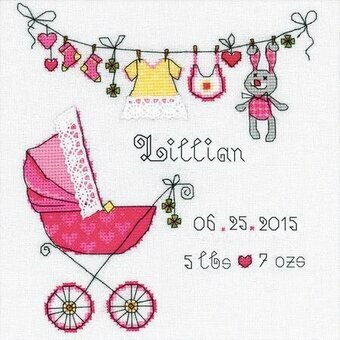 This cross stitch kit contains 10 count Zweigart Aida fabric, woolen and acrylic yarn (9 colors), ribbon and one needle. 6" x 6". Cross stitch kit featuring a rabbit watering his carrots. This cross stitch kit includes 10 count white Aida Zweigart fabric, Safil wool/acrylic threads (10 colors), needle, instructions and color chart. 6" x 6". 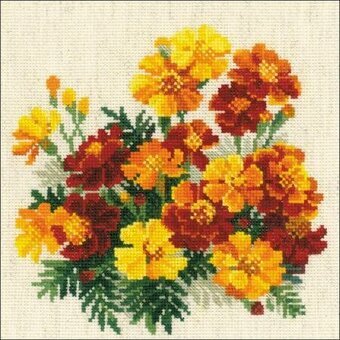 Cross stitch kit featuring Marigold flowers. This cross stitch kit includes 14 count flaxen Aida Zweigart fabric, Safil wool/acrylic threads (15 colors), needle, instructions and color chart. Size of finished piece is 20cmX20cm, 8"X8". This cross stitch kit includes 14 count flaxen Aida Zweigart fabric, Safil wool/acrylic threads (15 count), needle, instructions and color chart. 7" x 9.5". Cross stitch kit featuring a European landscape with a monastery. This cross stitch kit includes 14 count white Aida Zweigart fabric, Anchor stranded cotton threads (27 colors), needle, instructions and color chart. 15 3/4" x 11 3/4". This package contains 14 count Zweigart Aida for cross stitch, Safil wool/acrylic threads in twenty-seven colors, one needle, one color chart and instructions. Design: Moscow St Basil's Cathedral. Finished size: 15 3/4" x 15 3/4". This cross stitch kit includes 14 count Aida Zweigart fabric, Safil wool/acrylic threads (30 colors), needle, instructions and color chart. 13.75" x 23.5". 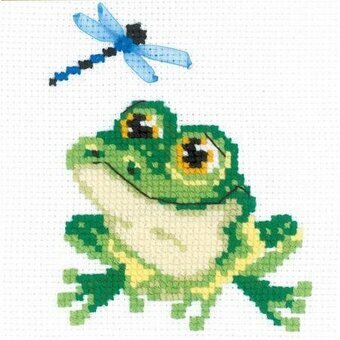 Riolis cross stitch kit featuring flowers and a dragonfly. 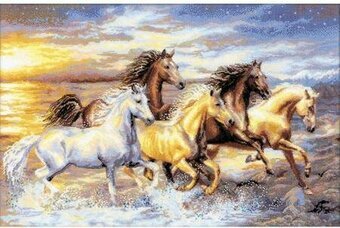 This cross stitch kit includes 14 count flaxen Aida Zweigart fabric, Safil wool/acrylic threads (16 colors), needle, instructions and color chart. 11.75" x 8.25". This package contains 14 count cotton fabric, color chart, wool and acrylic yarn (24 colors), and a needle. Finished size: 15.75x11.75 inches. 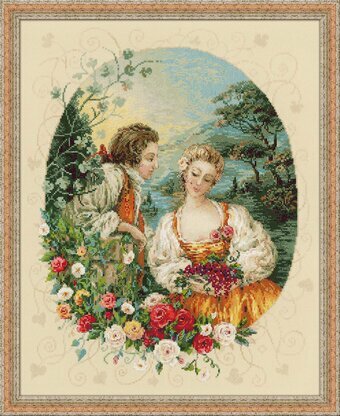 Cross stitch kit featuring a romantic scene with a young couple. This cross stitch kit contains 14 count Aida Zweigart fabric, Anchor stranded cotton threads (31 colors), needle, instructions and color chart. 15.75" x 19.75". 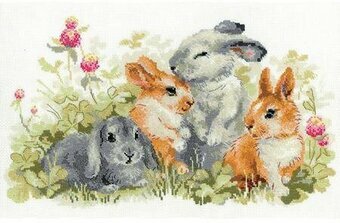 Cross stitch kit featuring a cat and a rabbit. 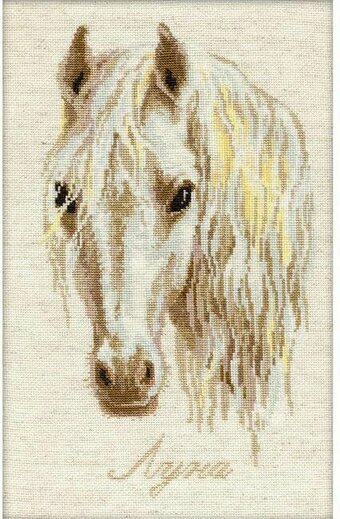 This cross stitch kit contains 14 count white Aida Zweigart fabric, stranded cotton threads (9 colors), needle, instructions and color chart. 6.25" x 5". 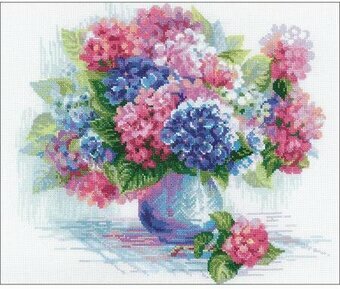 Cross stitch kit featuring flowers in a vase. This package contains 10 count cotton fabric for cross stitch, Safil wool/acrylic threads in twenty-seven colors, one needle, one color chart and instructions. Design: Peonies In A Vase. Finished size: 15 3/4" x 15 3/4". 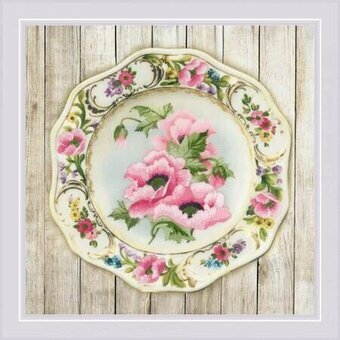 Cross stitch kit featuring a flower. Includes 14 count Aida Zweigart fabric with pre-printed background, Anchor stranded cotton threads (15 colors), needle, instructions, color chart. 8" x 8". Cross stitch kit featuring a Persian Cat. This kit contains 10 count fabric for cross stitch, woolen and acrylic yarn (fifteen colors), one needle, instructions and a color chart. 10.25" x 15", 10 Count. 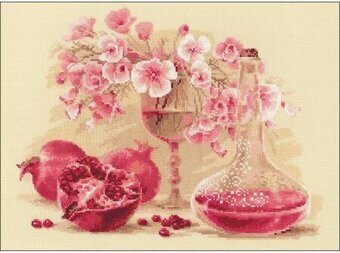 This cross stitch kit includes 14 count cacao Aida Zweigart fabric, Safil wool/acrylic and stranded cotton threads (10 colors), felt, 2 needles, instructions and color chart. 11.75" x 11.75". This cross stitch kit includes 14 count beige Aida Zweigart fabric, Anchor stranded cotton threads (15 colors), needle, instructions and color chart. 15.75" x 11.75". This cross stitch kit includes fabric with pre-printed picture, Anchor stranded cotton threads (10 colors), needle, instructions and color chart. 8 1/4" x 8 1/4". 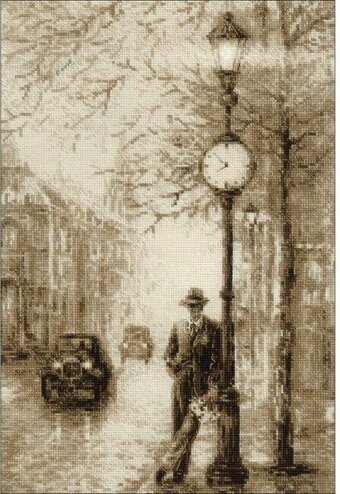 Cross stitch kit featuring a Winter country scene with a bird. This cross stitch kit contains 14 count white Aida Zweigart fabric, Anchor stranded cotton threads (25 colors), needle, instructions and color chart. 11.75" x 11.75". Cross stitch kit featuring a cat relaxing in a hammock. This package contains 14 count white Zweigart Aida Fabric, stranded cotton threads (6 colors), one needle and instructions. 6.5" x 5.25", 14 Count. 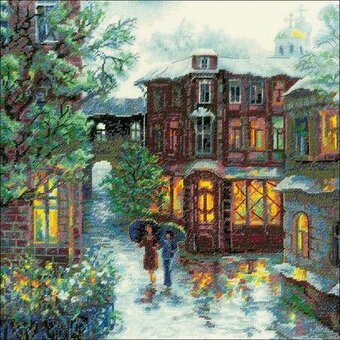 Cross stitch kit featuring a rainy Summer village scene. This cross stitch kit contains 18 count beige Aida Zweigart fabric, Anchor stranded cotton threads (25 colors), needle, instructions and color chart. 11.75" x 11.75". 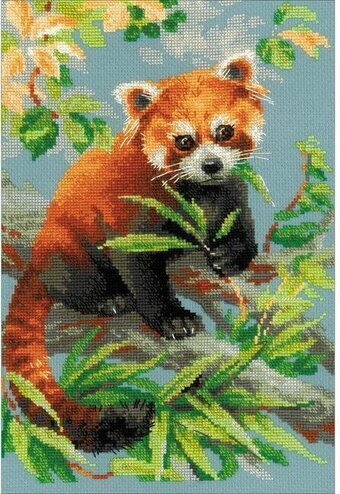 Cross stitch kit featuring a red panda. This package contains dark gray Aida Zweigart fabric, Safil wool/acrylic threads (22 colors), needle, instructions, color chart. 10.25" x 15", 14 Count. This cross stitch kit includes 10 count flaxen Aida Zweigart fabric, Safil wool/acrylic threads (23 colors), needle, instructions and color chart. Size of finished piece is 11.75" x 11.75".